The most common question we get from podcasters is "how do I grow my podcast?" There are lots of answers from leveraging social media to publishing an ebook, but this week we wanted to share a unique approach that less than 2% of podcasters are using. My name is Jason Rothman and last April I started a weekly podcast with my colleague Chris Schaeffer. Chris and I manage Google AdWords campaigns professionally, and last year we struck up a friendship based on our similar careers. Then we started doing quarterly phone calls where we’d share ideas and strategies and ask each other questions. After a few phone calls Chris and I thought, "you know what, these conversations would be pretty interesting to business owners out there who wanted to learn more about Google AdWords, so let’s just turn these calls into a podcast about Google AdWords." And that’s what we did. We’ve been hosting the Paid Search Podcast every week since last April, and our show is steadily growing. Let’s talk about the three things every podcast must accomplish to be successful. There are three hard things you must accomplish to create a thriving podcast. First, you must create entertaining and informative content that people actually want to listen to. Accomplishing this is up to you. Second, you must host the podcast files somewhere and make sure they are accessible on all the major platforms like iTunes and Stitcher. This is where Buzzsprout comes into play, and it is the best solution to quickly and affordably get your podcast episodes online and in the major platforms. And third, to have a successful podcast, you must grow an audience, and that is what I’m going to talk about below. The traditional methods of growing a podcast audience still work and should not be forgotten. Having guests on your show, being guests on other shows, sharing your show video on YouTube if you do video, encouraging your audience to share your show, being consistent on social media, and just generally grinding it out month after month and year after year growing your audience one show at a time. These are all great methods for growing your podcast audience, and you should definitely do all of these things. But what if you have a great podcast, you provide wonderful content, and you just want to grow your audience faster than the traditional methods allow for? If this is the case, then I recommend you look into Google AdWords to help your podcast grow faster. Most people know “Google ads” as those ads that show up at the top of the search results when they perform a search in Google. But Google’s advertising program, Google AdWords, actually encompasses a lot of other areas of online marketing beyond search advertising. With Google AdWords, you can run text search ads, display ads on other websites, and even YouTube video ads (Google owns YouTube). All three forms of marketing can be effective ways to grow your podcast audience. Search advertising on Google AdWords is, in my opinion, the best, most effective form of marketing ever created. On a well-run AdWords campaign, you only show your ads when someone searches for exactly what you offer. So you’re only advertising to people who want to find what you’re offering. And another great aspect of search advertising with Google is that it is pay-per-click. You only have to pay Google when someone clicks on your ad to go to your website. It’s incredibly efficient. For podcast owners, search ads on AdWords can be a great way to get found by people who would be interested in your podcast. For example, say you host a podcast about fishing. You can use Google’s Keyword Planner to find keywords like podcasts about fishing, fishing podcasts, and fishing shows, and then you can target those keywords in your search campaign and get your ad to show up on those searches. This way, when someone Googles fishing podcasts your ad will show up at the top of the page and you have the potential to reach a likely new listener. In addition to search advertising, Google also runs a display advertising network that reaches over two millions websites and over 90% of the people using the internet. It’s a massive advertising network. And these kinds of ads are the display banner ads that you see while browsing your favorite websites (not all banner ads online are from Google AdWords, but many are). On search ads, what someone types in Google determines when your ad shows up. But on the display network you get to target a specific audience. And when someone in that audience is browsing a website that runs AdWords ads then your display ads will be eligible to show. And most display campaigns are also run with pay per click bidding. So you only have to pay when someone clicks on your display ads. Targeting a remarketing audience is a great place to start with display advertising. With remarketing, you re-market to people who have recently been on your website. A person being on your website within the last 30 days shows that they’re interested in you and a warm prospect. So remarketing to those people can help you build brand awareness, stay on the top of their minds, and bring them back to your website. With display ads you can also target web pages that are about the topic of your show. Sticking with our fishing example, you could run your display ads on pages that talk about fishing. If someone is interested enough to be reading a web page about fishing, then they could potentially be new listener for your show. You can also target affinity audiences on a display campaign. There’s no affinity audience yet for people who are fans of fishing. But there is an outdoor enthusiasts audience that could be a good fit for a fishing podcast. There are other audience targeting options, and running a display campaign on Google AdWords is a great way to grow awareness about your podcast and affordably bring potential listeners to your website to introduce them to your show. YouTube is awesome. I’m a big fan of a lot of YouTube channels, and I’m on there all the time. And so are tons of other people. In fact, YouTube has over one billion active users each month. It’s a great way to affordably reach large, relevant, and new audiences. Google owns YouTube, and you can advertise with video ads on YouTube through Google AdWords. With YouTube ads, you run video ads and you bid on a cost per view basis. So in order to advertise with video ads on YouTube you need to have videos of your podcast (or a short commercial-like video that introduces your podcast). Many podcasts produce video segments of their episodes, and these segments would be great for YouTube advertising. On YouTube you can target the same types of audiences you can on the display network, like videos about a topic, people who are interested in certain topics, and also your remarketing audience. If your fishing podcast had video segments, you could run your video segment as an ad to show up before people watched fishing videos on YouTube. So right before the fishing videos starting playing, your ad would play and you’d get to introduce your show to someone who is interested in fishing. YouTube is a great way to reach new listeners who are interested in your show topic and introduce them to your podcast. Go Far Fellow Podcasters, Go Far! Traditional ways of growing a podcast audience are time-tested and really do work. At the Paid Search Podcast we engage in those traditional growth strategies and recommend that you do too. But we also recommend that you compliment those traditional growth strategies with a well thought-out Google AdWords marketing plan that encompasses search, display, and YouTube advertising. The beautiful thing about Google AdWords is that you can find very specific audiences that are potentially interested in specifically the topic that your podcast is about, and then you can reach that audience with search, display, and YouTube ads. Google AdWords is very flexible and you can get started with a small budget. Experiment with AdWords, find out what works for your kind of podcast, and then increase your budget on what’s working, get more quality traffic to your podcast website, and grow your show. Good luck! 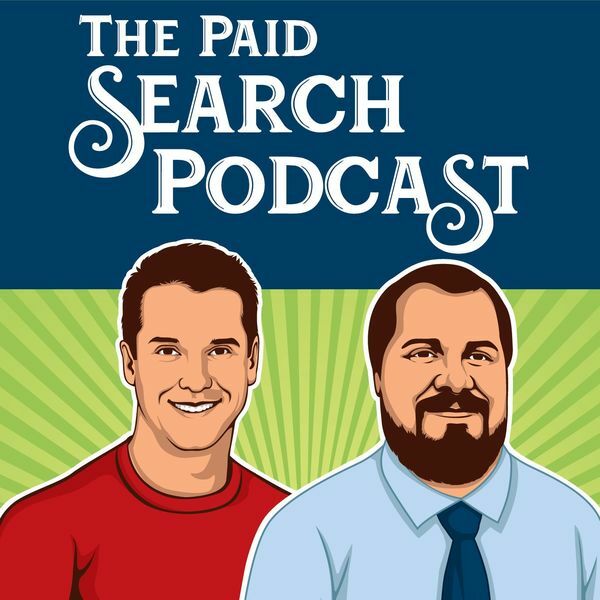 Jason Rothman and Chris Schaeffer are professional AdWords consultants and hosts of the Paid Search Podcast. Jason can be reached at his website, rothmanppc.com, and Chris can be reached at his website, chrisschaeffer.com.